With the warm weather finally upon us I am sure you are excited as I am for the upcoming festival season. I mean who doesn’t like listening to music all day while basking in the warm sunshine with their besties? Anyways back to my point… If you are like me you always want to be the trendiest girl at the festival, which means not just having the perfect outfit, but also the perfect hairstyle. That is why with the help of my ‘L’Oreal Professional’ Hairstylist Anna Giannini, I was able to recreate some of my favorite festival hairstyles. As an added bonus Anna has included tips to help you achieve these looks at home and she is also doing a giveaway (details below)! As a quick side note, next weekend (June 10) I am heading to The New Farm festival with my besties @Stylemajeur and @TheBlondeMann to film with @FordCanada! In preparation for the festival I am taking over @SheblogsCanada Instastory (June 3rd, 2017) as we go shopping for the ultimate festival outfits and must-have travel gear! Not only would we love for you to join us, but we would love to hear from you and answer any questions you have about festival hairstyles, beauty looks, outfit inspiration, The New Farm Festival, the project with @FordCanada or any other burning blogging questions you have – SO MAKE SURE TO HIT US UP! Okay, let’s get started, shall we! I LOVE this look! It’s feminine, yet rock and roll and is so easy to do – it’s literally just one single small braid! To secure the bottom of the braid we used a tiny clear plastic elastic (available at Shoppers Drug Mart) and to upgrade the look even further we added in small hair embellishments/accessories Anna bought from TopShop. If you can’t find these embellishments at your local TopShop I’m sure you could use small hoop earrings or whatever you have at home. This look is so versatile and goes great with straight hair as well as lose waves. Whatever your style be prepared to be the most BADASS babe at the festival this year! This Boho inspired festival look is totally giving me Daenerys Targaryen vibes over here – am I right!? I love this braiding method and although it looks complicated, Anna used this great twist method that actually made it super easy to do. To secure the end of each braid we used small clear plastic elastic. After all three braids on each side of my head (total 6) were finished she then created a final braid down the back of my head using the ends of the waterfall braids. 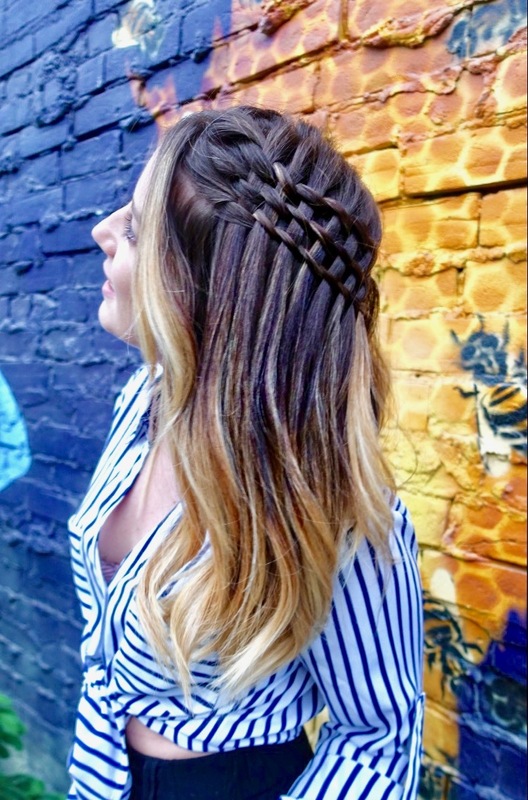 Waterfall braids are the perfect hairstyle to add to any feminine festival outfit you wear this summer. As a matter of fact I would totally rock this to work or even on a first date! If you are not sure how to do waterfall braids I found a great tutorial on YouTube which I will include a link to below. Triple Threat Babe – Cornrow High Ponytail! If you are a dancing machine like me sometimes, you need a hairstyle that is as functional as it is stylish. When you are in the sun all day partying like an energizer bunny, I’m sure you’ll be thanking me for this one! Not only is it functional but it’s super easy to do. Part your hair into two sections: the top, which you will further split into three to make your three cornrows, and the bottom, which you will tie with an elastic band so it will stay out of your way while you work on the top. Next, braid your three cornrows and secure each one with a small clear plastic elastic. Brush your bottom section into the perfect high ponytail incorporating the ends of you cornrows into it and secure with an elastic band or ‘bungee elastic band’ if you have one. Take a small strand of hair from your high pony and wrap it around the ponytail to hide any sign of an elastic. Then secure the strand in place with a bobby pin. There you have it my friend! Now you are ready to hit the dance floor! A super popular hairstyle I have been seeing a lot of this year is the ‘double bun’. 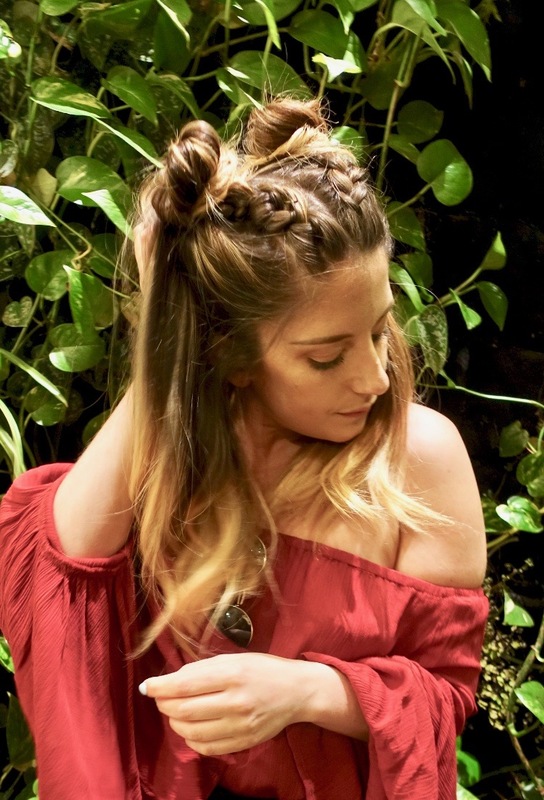 There are so many different ways to do this look, but one of my all-time favs is the half up double bun with braids as pictured here. Again not as difficult as you may think! If you want to go all out and elevate this look even further (YES I love it! Let’s be friends!) spray the centre split with hairspray and add some glitter! Again, I would honestly rock this look without going to a festival. Perhaps on one of my ‘in-between days’ where my hair is not really clean but I’m to lazy to wash it…. ya feel me! So now that this article has you buzzing with excitement and inspiration for your next festival, it’s time to talk about Anna’s Instagram giveaway! To get you even more pumped Anna is giving away a ‘Festival Styling Session’ to one lucky winner *cut and colour not included – strictly styling*. Want to be the most badass babe at your next festival? Here’s what you gotta do! Show us some love by liking the contest photo on any of our accounts (@SheblogsCanada, @SoheilaOnline, and @Anna_G_Stylist)! The contest closes June 10, 2017 and is open to Toronto residence only. Sorry dudes but you got to be able to get to the salon! 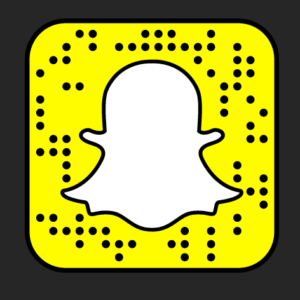 Also, if you have any questions or just want to chat add me to Twitter @SoheilaOnline or Snapchat at SoheilaHakim I’d love to hear from you!